Which isn't good really is it. no, I mean it shows we aren't self sustaining despite the budget cuts, and we aren't necessarily in a good position when that money becomes due to Power/don't know what the terms are. It's better than him not funding it. He's done it as an investment and if he makes cash when flipping the club then fair enough. Well we've improved to the tune of £1.5m, debt has decreased overall, it may have increased slightly on long term debts but reduced the current liability. Overall positive. The level of powers funding returned to what it was two years prior. It's like the scene in Godfather Part III when Pacino growls out "Just when I thought I was out, they drag me back in"
We don't know the reason for the increase in Power having to put in more money. It may be to fund player acquisitions or it may be, by 31st May 2017, the cash flow is difficult but is less so when the season starts. Abbreviated accounts don't show enough to draw any proper conclusions. We can't determine if it's positive or negative either in my opinion. I see that Luton are "breaking the bank" in their attempts to get promotion this season, their accounts have been released for last season and they lost £31,000 a week. The figures in brackets are for the previous season. Their total wage bill, including players, football and non-football staff, was £2.4 million. Thats a loss of £46k per week. Chesterfield made a loss of £506,735 for the 2016/17 financial period. 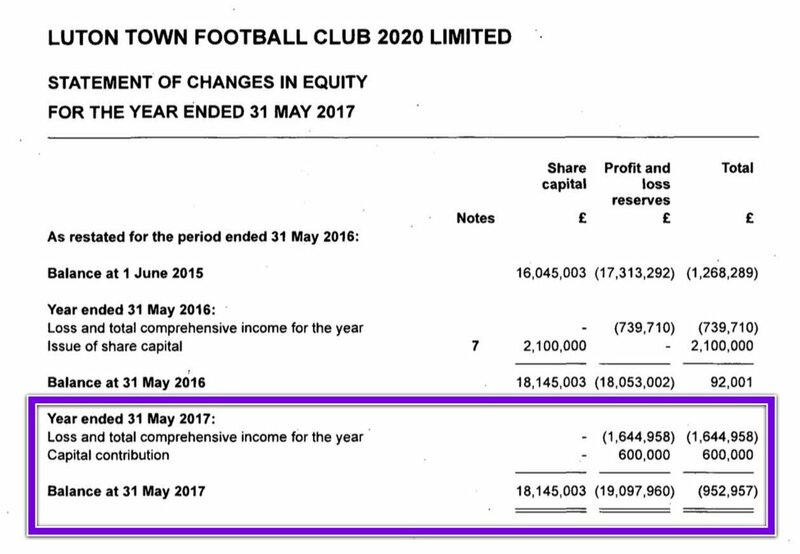 I don't really understand profit/loss accounts but that sounds like a lot for Luton to be losing and it shows what a good cup run can do to a club in Lincolns case (along with winning the division). As with everything, extra income, whether derived from a cup run or player sales, needs to be reinvested wisely if it is to benefit the club. All too often it disappears into some black hole with very little explanation. Think Luton have sold a shed load of players for big money recently which should help to balance the books. They would have to! I know Marriott went to Posh for around £500k and Vassell went to Birmingham for around £1.25m have they sold any others for big money? Lloyd Jones joined them from Liverpool for £150k, Collins from Crawley for £300k, Jake Jervis £150k also. I think they sold Cameron Mcgeehan to Barnsley for about a million quid.